Simon & Schuster Children's Publishing, 9780689814877, 48pp. It's time for Passover and Pearl and her brother, Avi, are helping to prepare the house for company. Grandma, Grandpa, Aunt Rachel, Uncle Solly, and "the two terrors from Teaneck," cousins Harry and Sophie, are coming to spend the holiday at Pearl's house. Pearl frets about getting along with her cousins. Her brother, Avi, is anxious about reciting the Four Questions at the Seder. But as soon as the guests arrive, Pearl and her cousins are too busy baking matzoh, making Passover place cards, matzoh covers, and preparing the Seder plate to worry about anything. As Pearl's family comes together for Passover, she learns the importance of family and faith and finds out that the real meaning of the holiday only grows stronger when it is shared with loved ones. 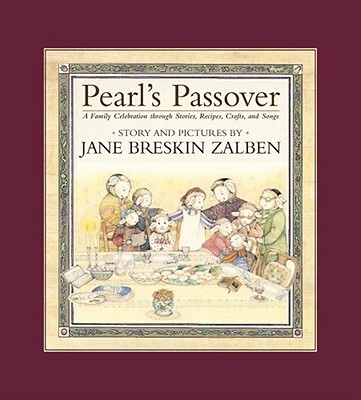 Jane Breskin Zalben's intricately detailed, jewel-like illustrations are a delight to the eye and evoke the warmth and joy of Passover. Easy-to-follow instructions and recipes are included for each activity, making this ideal for families who want to include their children in their holiday festivities.